It has been a quite a LONG while, huh? So many things have happened in my life since last you’ve heard from me here, but I am all TOO excited to announce the big move I’ve been working towards for some time. Pen Doth Persist is moving! Starting very shortly here (some time this week) this blog will be moving to my new official website Pennydoth.com. Who would’ve thought that building this blog would snowball into avenues and meetings I never expected? When I started blogging here, I wasn’t too sure of what I wanted this platform to be about and where I wanted to go creatively. I knew for sure, though, that I needed to put my dreams of illustrating professionally into action and they needed a starting point. This blog was the word GO. That time spent was nevertheless required growth for me, and allowed me to go through changes that I needed to experience within myself, ultimately solidifying my resolve to do art full-time. Fast forward to now, and I’m happy to see the beginning of a new chapter of what I hope to be an exciting, ever-evolving, enriching career, and a continuous path of my own choosing. I hope you enjoy this new journey with me! YAY! My first post of the new year! Hope 2017 has been good for you all so far! Here’s a peek at my latest endeavor: art composition practice and photo studies. This was a good exercise on controlling my edges and keeping the focus of the shot clear. Not too shabby for my first try. Maybe I shouldn’t sweat details so much next time though…. All mentioned content is purely for entertainment/informative purposes. All links provided for each respective topic are of sites I find trustworthy (a.k.a. safe to browse) with any following content the property of those admins. Any unexpected roads to elsewhere are at the discretion of your own browser/internet provider’s security settings …annnd hopefully a good firewall. Please pardon me if I am not too accurate with the subjects I post about. I do try my best to stay current and not generalize. Constructive criticism and “Grammar Nazis” are welcome (especially about my artwork ^_^), but no flames …[pretty] PLEASE? If you have anything to add, correct or would like to share any cool topics you’d like me to draw for, feel free to click on the links towards the bottom of each page, or drop me a message here! Hey everyone! So a dear friend of mine and fellow artist, got me privy to a YouTuber who goes by the name Shameless Maya, and told me to check out one of her interviews. In this video, Maya and her friend talked about the importance of self-promotion, and how they became successful. They promoted their works or activities everyday for a YEAR! Doing so not only boosted their confidence, they also learned their self-worth and invested their time productively, because they were doing something they loved. They also built a huge network. Since they challenged viewers to do the same, I decided to give it a shot! Here’s to my #beshameless Kickoff Week! Wanna participate? Get started today by using the above hashtag, use Twitter or Instagram or any SM of your choice and post something you’re proud of today. It could be anything you’re working on: a website, a band you’re forming, your art, an Etsy store with your latest crafts on sale, or just something positive you did that got someone’s positive attention—an award even! Feel free to connect with me on any of my social media to keep in touch with the #beshameless community. This is a means and platform for YOU to build success, a foundation and just feel good about yourself. If you’d like to follow my friend, you can find her (and her art) via the info below! Reposting an old favorite from last year! A happy , safe holiday and good time for all those celebrating! 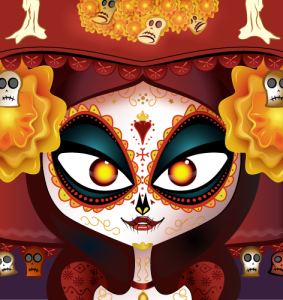 Feliz Dia de los Muertos! Make that several days. This past week marked the end of the annual, 3-day-long Mexican celebration of the deceased and ancestors long passed: The Day of the Dead. I remember first learning about this holiday during high-school from one of my Spanish teachers. I was hooked ever since! Inktober 2016 – The Final 31! So I’ve NO idea who this is supposed to be, but it figures number thirty-one is when I try a new inking method that, I think, looks a bit cleaner than all the previous. In any case HAPPY HALLOWEEN! Want to see my other entries for Inktober so far? Check ’em out! Settled on drawing a different spin on LIBRA this time around! He’s based on …uh…way-too-many-gods lol. ONE MORE TO GO for #inktober! I admit this looks a bit like an earlier submission, but…ah well. On to the next one!